Since 1973, Appalachian Heritage has served as a major outlet for the creative writing and art of the Southern Appalachian Region. They have provided readers with a primary way to stay abreast of regional literature by publishing most of the region’s well-established writers as well as many exciting new voices. Each quarterly issue contains work from a variety of writers along with selections from a featured author and a featured artist or photographer. They publish poetry, stories, and creative nonfiction. Their creative nonfiction includes literary criticism and literary biography of their featured authors, book reviews, memoir pieces, and articles that explore contemporary issues that affect our region, including environmental and health problems and issues of race and gender. Two of my involvements of late tie to the theme of this issue of Appalachian Heritage. At the request of Bill Ferris and Charles Reagan, I wrote the foreword to the critically acclaimed Encyclopedia. A year or so after that, at the request of John B. Stephenson, president of Berea College, I narrated Once Upon a Vision, a documentary film of the bold and continuing efforts to achieve interracial education at the college. This issue of Appalachian Heritage combines those themes of the Encyclopedia and the Berea documentary. It, too, is the labor of community workers, pastors, school teachers, photographers, college professors, writers, and others who have experienced, sensed, assessed intellectually, and helped to define what it is like to live and work in Appalachia and the South. The mix of writers includes the old and young, the black and white, the urban and rural. The works represent present residents of the region as well as those having migrated from their Appalachian roots. Some of these presentations are well documented from primary research source materials, and others rely on oral history. Yet others represent the musings of Appalachians who themselves are coal miners, quiltmakers, folk artists, and the front-porch keepers of the culture. The result is a kaleidoscopic view of a rich, unique, and heretofore largely invisible people: the black people of the Appalachian region. It is highly significant that this compendium comes forth at this time and from this special place (Berea College) about a largely forgotten group of people in the American mosaic. 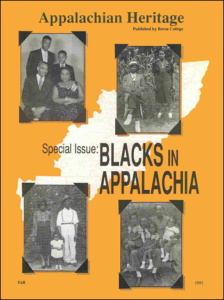 A few years ago John Stephenson said that Bill Turner, his student two decades previously, “probably knows more about black people in the mountains than anyone in the world.” I am pleased to see Bill serving as special editor of this edition of Appalachian Heritage. And I’m pleased to help in spreading knowledge of the Appalachian experience through this special issue. ~ Alex Haley.